Before I started working at the Isabella Stewart Gardner Museum, I had often heard its founder described as a pioneering collector. Few art historians, however, could explain to me what this meant. Research for a forthcoming exhibition, ‘Off the Wall: Gardner and Her Masterpieces’ (10 March–15 August), offered answers hidden in plain sight. Faced with the challenge of closing the museum’s piano nobile for roof maintenance, a necessity pushed forward by last year’s record snow fall, curator Christina Nielsen devised a solution as practical as it is clever. Together, we chose the 25 best paintings and drawings from this floor – including works by Rembrandt, Rubens, and Michelangelo – for display in our temporary exhibition gallery and, with curatorial research fellow Casey Riley, have supplemented them with archival materials relating to Gardner’s acquisitions. Anyone who has visited Gardner’s neo-Renaissance palace, Fenway Court, will understand why this is an unprecedented event. Whereas many museums present their art with accompanying explanatory texts in well-lit white cubes, our permanent collection is fixed in the Gilded-Age installation stipulated by the founder on her death in 1924. Moving Gardner’s masterpieces from the historic palace and into the Renzo Piano-designed exhibition space, where each one can be lit to its best advantage, unobstructed by furniture and supplemented with informative texts, provides a rare opportunity to see them all afresh. Careful examination of individual paintings offered a new appreciation of their finest details and exacting techniques. Take, for example, the Virgin and Child with infant Saint John the Baptist and six female saints by Andrea Mantegna. He inscribed this jewel-like devotional painting with the words ‘ANDREAS MANTIN[IA]’ on a rock ledge in the foreground, but in letters so tiny that they are only discernable at close range and in good light. 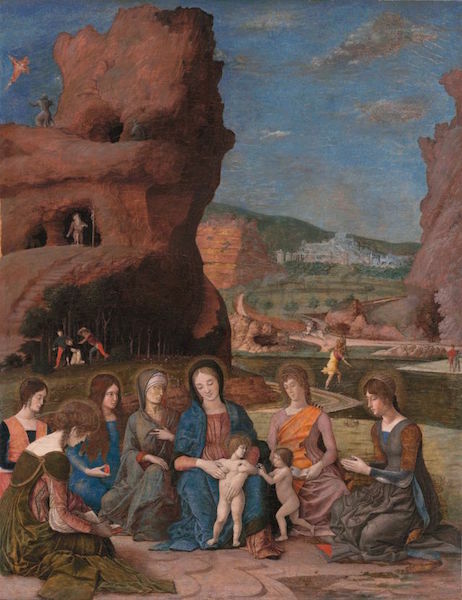 That Mantegna conceived of the Virgin and Child as a work for sustained contemplation is also attested by its elaborate sacred landscape, embedded with equally miniscule episodes from the lives of five saints. St Christopher fords a river at its established crossing, marked by stakes linked together with black cord, while nearby a dragon emerges from his cave in the final showdown with St George. This rare work by the court painter to the Gonzaga family no doubt appealed to a collector who fashioned herself as a modern-day Isabella d’Este. In 1899, Gardner acquired it through the intervention of archaeologist Richard Norton. Working on this exhibition, it surprised me to learn how many individuals were instrumental in helping to build her art collection, beyond the celebrated connoisseur Bernard Berenson. Indeed, the Mantegna led him to opine in a letter to Gardner, ‘But, oh, I do wish you had not bought it without consulting me.’ Their relationship was hardly exclusive and her opportunism often provoked his jealousy. In 1907, Gardner acquired Gentile Bellini’s The Seated Scribe with the help of society portraitist Anders Zorn, causing Berenson to seethe with envy. Letters, photographs, and drawings from the museum archive shed new light on the mechanics of buying by correspondence. Telling in this context is a recently discovered watercolour of Piero della Francesca’s Hercules. The art dealer Elia Volpi offered this remarkable fresco of the mythological hero to Gardner through American painter Joseph Lindon Smith, during his tour of Italy in 1903. Smith relayed the news back to his patroness in Boston, where images of it were available only in black-and-white reproduction. The watercolour, commissioned by Volpi and forwarded to Gardner, renders Hercules in colour and with enough detail to suggest its condition, including vertical cracks in the plaster surface. She acquired the fresco for $40,000 and it became the first Piero in the United States. In the process of drafting labels for these 25 masterpieces, one word kept popping up: ‘first’. Besides the Piero, Isabella Stewart Gardner’s careful purchases brought to the United States the first paintings by Raphael (1898), Fra Angelico (1899), and Simone Martini (1899). And even if she cannot be credited with the American debut of Botticelli – that accolade goes to James Jackson Jarves, whose Virgin and Child (Yale University Art Gallery) is now more accepted than it once was – Gardner’s Tragedy of Lucretia was his first significant work to reach these shores. Since the names of these Renaissance painters are common currency in today’s museums, it is easy to forget the time when they were not. Gardner triumphed in the face of fierce competition, making masterpieces of European art available to audiences in the New World and shaping the future of artistic taste in America. From the March issue of Apollo: preview and subscribe here. How important was drawing to the Renaissance sculptor?